My daughter Poppy and I have just come back from a long weekend in Brighton and it’s on the sea front there that these photographs were taken. 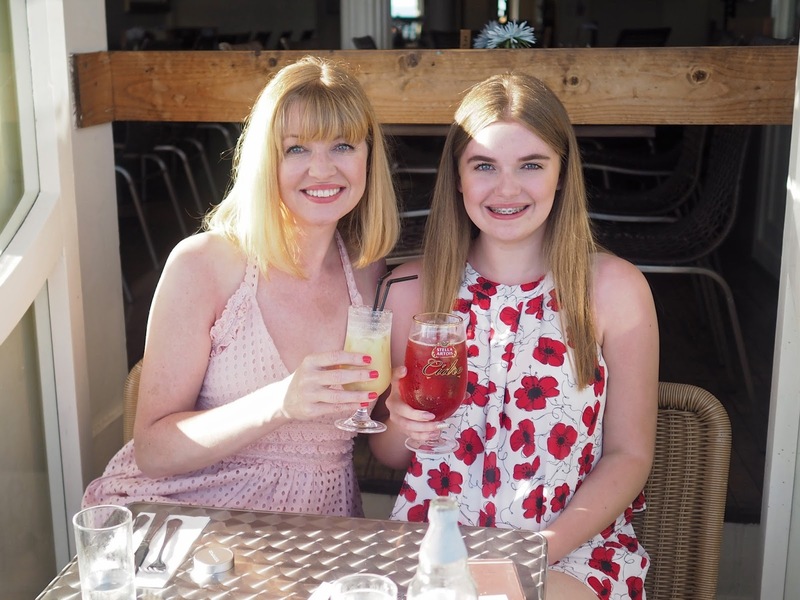 My son is away on a foreign exchange trip and because Poppy has finished her GCSEs, we decided to grasp the opportunity to spend some time together and take a mini-break to somewhere had both been keen to visit. 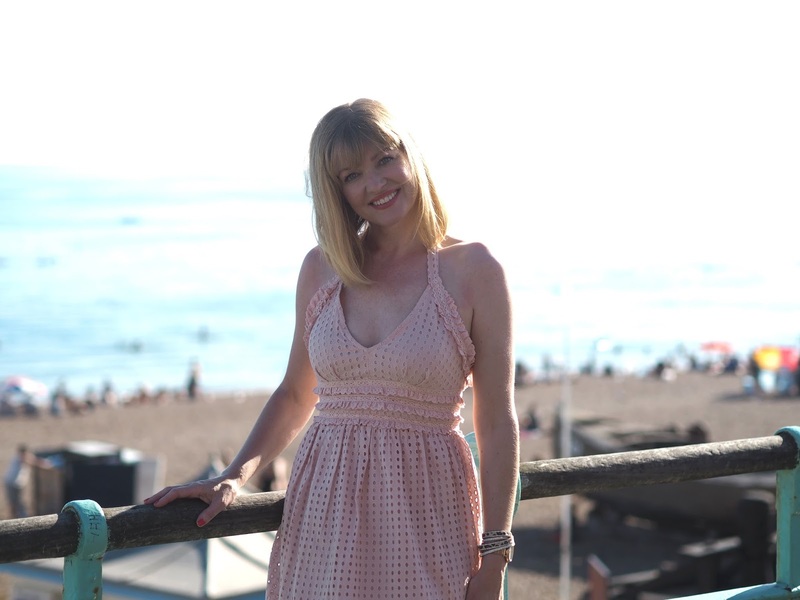 It was a wonderful few days, made even more special by the glorious weather and it was lovely to be able to wear this dress, bought just last week from Topshop when trying on outfits for York Races, where I’m going on Friday. I fell in love as soon as I saw it. The ruffles, the midi length, the halter-neck, the broderie anglaise and the divine shade of shell pink had me at hello and I was smitten. It isn’t quite right for race day, but is utterly perfect for our family holiday in Nerja, (which is now less than two weeks away now- can you tell I’m excited? ), and for our autumn holiday in Lanzarote. I don’t often shop for myself in Topshop, it’s usually for Poppy, but I was surprised by just how many things caught my eye and how many I could and would wear without the fear of being accused of “borrowing” from my teenage daughter’s wardrobe. My shopping trip last week really opened my eyes. The detail is exquisite. I can’t think of a prettier combination of texture, detail and colour- this has to be a contender for the most feminine dress in the world. It’s so rare to be able to go out in the evening in this country without an extra layer of some description so we made the most and dined al-fresco. Thank for the lovely comments and feedback on my Instagram Stories that I shared while we were there. I’ll put together a blog of edited highlights, (and there really are so many), because it’s a fabulous, vibrant place to visit and I’m still buzzing! Leopard and diamante wrap bracelet, £12.50, Lizzy O (Sign up to my monthly newsletter here for exclusive subscriber discounts at Lizzy O). Previous Post Witchcraft, Ghosts and The Hangman; A Tour To Remember. Next Post Brighton Rocked! A Long Weekend Away. YES!! It's totally the most girliest dress I've seen in a long time! And it looks absolutely gorgeous on you, Lizzy! That dress is so you Liz! it suits you perfectly and flatters you so much.